We had tacos on the mind and also craved Asian flavors, thus was born our MexiAsian fusion 5-spice seasoned duck tacos with 5-spice tortillas. We started off with the duck breasts we found while freezer diving (our latest attempt at not shopping until we use up what we have in the freezer and pantry), then began to build our ingredients list around it. We had some red and green shiso (a member of the basil family that is frequently used as a garnish in sushi restaurants) as well as a large section of daikon in the fridge (those things last forever!). We also discovered an unopened bag of Instant Corn Masa and thought mmm, 5-spice flavored corn tortillas! Homemade corn tortillas are surprisingly easy to make, especially when you use the instant corn masa, and you can add extra flavoring to make your tacos sing. Adding the 5-spice seasoning (a blend of cinnamon, allspice, cloves, Scichuan peppers, and fennel seeds are a common combination) to the dough created mind-blowingly delicious tortillas! We purchased an inexpensive wooden tortilla press for $15 at a local Latino supermarket for easy tortilla making (check out this one on Amazon) and were cranking out tortillas in no time (this is an excellent job for kids as we found out). Next, we grated the daikon and quick pickled it in a mixture of white wine vinegar, water, sugar and salt; then we chiffonaded (cut into thin ribbons) the shiso. We coated the duck breasts in 5-spice then sous vided (cooked vacuum sealed in a water bath) them at 135 degrees F for 2 hours. The meat was perfectly medium-rare and fork tender! If you don't have a sous vide device (though I highly recommend getting this failproof device! ), simply roast your duck breasts in the oven or on the grill. I've given instructions for both below. Heat water to 135 degrees F. Place seasoned duck breasts in a zip lock bag and place in water for 2 hours. When done cooking, remove from water and bag, pat breasts down to remove moisture, and sear on both sides in a hot oiled skillet (or use a torch to brown) to brown. To grill, place the breasts skin side down on a medium heat grill. Cover and cook for about 10 minutes. Turn and grill for about another 5 minutes. Keep checking during both turns to avoid flareups from the fat. Move to a cooler section of the grill if the meat is scorching too much. Let the meat rest for about 10 minutes, then slice thinly at an angle and set aside when ready to plate. In a bowl, combine 1/2 cup sugar, the vinegar and 1 cup lukewarm water, and stir to dissolve sugar. Pour over vegetables. Let marinate at least 1 hour before eating, or refrigerate for up to 4 weeks. Remove vegetables from liquid before using. Follow the package instructions for the correct masa to water ratio for the amount of people you are serving. Once dough is made, form small balls and press in the tortilla press (alternatively, you can use a rolling pin on a clean, lightly floured cutting board). When ready to cook, simply heat a lightly oiled skillet over medium-high and cook tortillas on each side until lightly golden. Set aside in a cloth lined basket and keep warm. 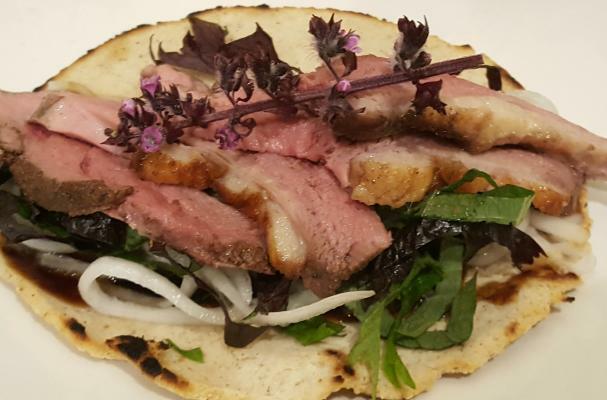 Place the daikon pickles and a few slices of duck on each tortilla, top with the shiso and a drizzle of hoisin sauce, and serve with or without the hot sauce of your choice (we recommend sriracha). Note: this post includes Amazon Associates links.